2Mix ricotta cheese, 1-1/4 cups of the mozzarella cheese, 1/4 cup of the parmesan cheese, parsley and egg until well blended; set aside. 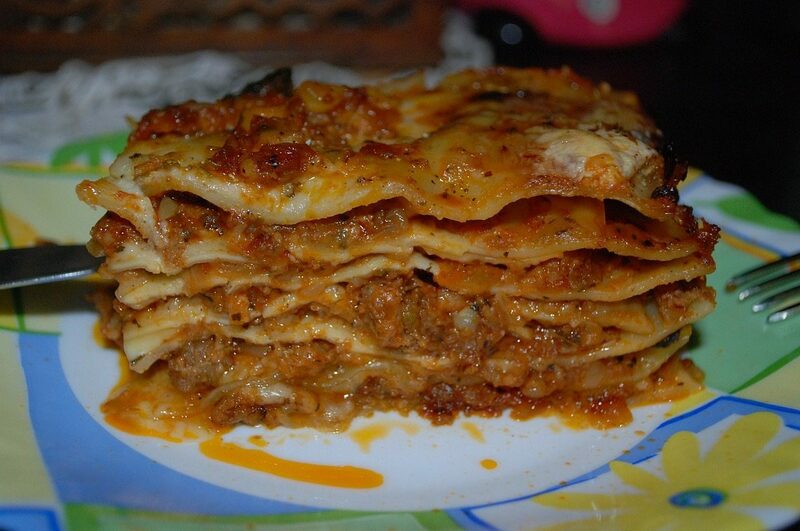 5Spread 1 cup of the meat sauce onto bottom of 13×9-inch baking dish (this way the noodles won’t stick to the pan); top with layers of 3 lasagna noodles, 1/3 of the ricotta cheese mixture and 1 cup of the meat sauce. Repeat layers two more times. Top with remaining 3 noodles and the remaining meat sauce. 6Sprinkle with remaining 1-1/4 cups mozzarella cheese and remaining 1/4 cup Parmesan cheese. 7Cover tightly with greased foil. 8Bake 45 min. Remove foil; continue baking 15 min. or until heated through. Let stand 15 min. before cutting to serve. Source: Kraft Food & Family Magazine. Rather than direct linking, I reposted it because they regularly change the URL. I like this lasagna recipe because it’s fairly simple and uses ricotta cheese instead of cottage cheese.